The Milky Way is a galaxy in the universe, which is home to the United Federation of Planets, the Klingon Empire and the Romulan Republic, among many other cultures and species. The Milky Way is roughly 100,000 light years in diameter and between 900-3,000 light years thick. It contains an estimated 100-400 billion stars, as well as nebulae and various spatial anomalies. The galaxy is also surrounded by a galactic barrier, that proves difficult for passage in and out of the galaxy by conventional space travel. The galaxy is commonly divided into four quadrants, the Alpha Quadrant, the Beta Quadrant, the Gamma Quadrant and the Delta Quadrant. Most astrometric representations of the Milky Way depict the border of the Alpha and Beta Quadrant running through the Sol System. There are two known permanent pathways which connect distant parts of the Milky Way: The Bajoran Wormhole connects the Alpha and Gamma Quadrant, while the Iconian gateway network connects the Beta and Delta Quadrant via the Jenolan and Solanae Dyson Spheres. Each pathway spans approximately 70,000 light years. The Milky Way is part of the Local Group, a structure of several galaxies bound by gravity. Of these galaxies, the Milky Way is the second largest one, with the bigger Andromeda Galaxy being almost 160,000 light years in diameter. Contact between cultures of the Milky Way and other galaxies has been sparse, mostly due to the immense distances between galaxies. However, the Iconian gateway network also leads to the Andromeda Galaxy via the Andromeda Dyson Sphere. For a detailed list of historic events, see Chronology and related articles. The Milky Way is estimated to be up to 13 billion years old, based on the analysis of some of its oldest structures. The history of sentient life in the Milky Way started four billion years ago, when the Preservers came into existence. They were the first known sentient species in the galaxy and subsequently seeded many worlds with the potential to develop life in their own image. Ever since, the Milky Way has seen the rise and fall of many powerful empires, such as the Tkon and the Iconians. In more recent history, interplanetary empires have formed in all corners of the galaxy and cross-galactic diplomatic relations have been established, connecting all four quadrants via wormholes, gateways and subspace networks. The local space of the Alpha and Beta Quadrants is dominated by a fledgling Alliance of the Federation, the Klingon Empire, and the Romulan Republic. The known Delta Quadrant has recently been united in the Delta Alliance against an emerging Vaadwaur threat. Large stretches of the Gamma Quadrant are controlled by the xenophobic Dominion. During the recent Iconian War, forces of all four quadrants have united against a common enemy for the first time. A short time later, the Hur'q threat deepened the necessity for intragalactic cooperation. It has also been revealed that by the 28th Century, most major galactic powers will become part of a Galactic Union. See List of Sectors and Systems and Sector space for a detailed overview. Only a small fraction of the Milky Way has been explored, and just a specific section is playable in Star Trek: Online. Each quadrant is broken down into sectors which contain star systems and other areas, such as nebulae or space stations. Travel between star systems takes place in sector space. Each playable section of a quadrant is represented by an in-game map in 2409-2410. Additionally, the Beta Quadrant is featured in maps representing the political composition of the years 2256 and 2270, respectively. 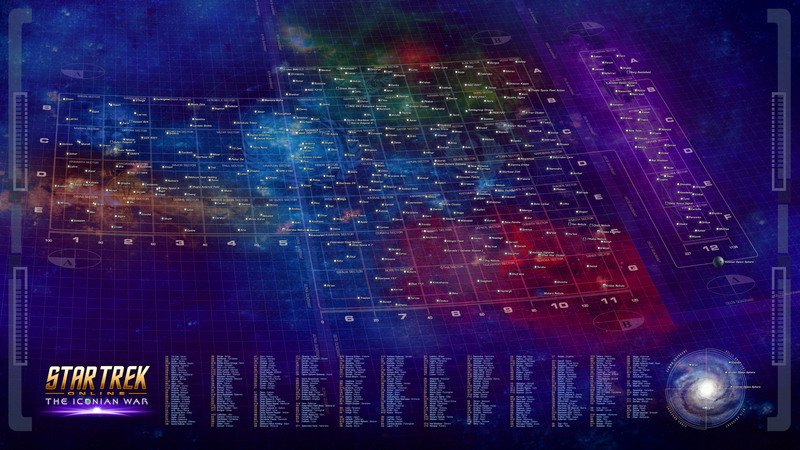 While a few cases of artistic license are encountered, the layout of sectors and star systems in-game is largely based upon the book Star Trek: Star Charts, created by Geoffrey Mandel in the early 2000s. Similar maps have been seen on-screen in Star Trek Into Darkness and on Star Trek: Discovery. The traversable section of each the Alpha and the Beta Quadrants spans approximately 200 light years. The traversable section of the Delta Quadrant spans close to 40,000 light years, featuring territory from seasons 3-6 of Star Trek: Voyager. This huge section of space has been heavily condensed for playability. Milky Way Galaxy at Memory Alpha, the Star Trek Wiki. Milky Way Galaxy at Memory Beta, the non-canon Star Trek Wiki. Last modified: 24 November 2018 at 21:51.